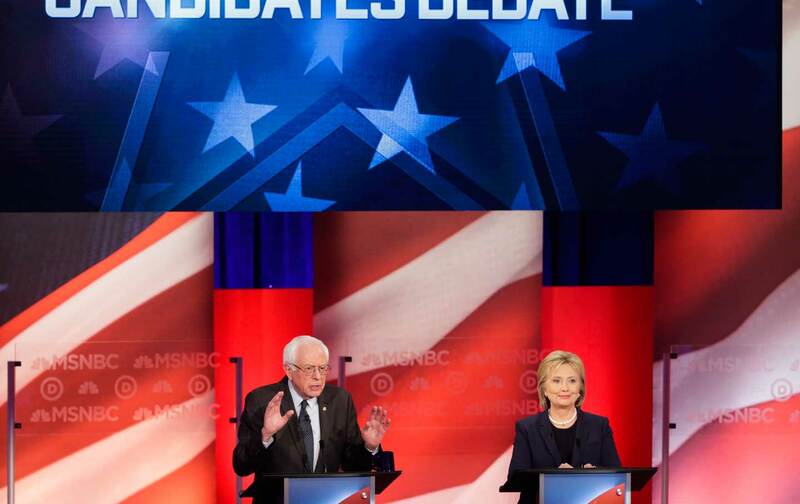 Clinton says “the numbers just don’t add up.” Sanders says America needs a new calculus. So said Hillary Clinton on Thursday, as she used a freshly scheduled MSNBC debate to tell New Hampshire Democrats—and, by extension, Democrats across the country—that the “political revolution” Bernie Sanders proposes is a fantasy rather than a serious vision for change. In the first one-on-one debate of a campaign that will see its first primary on Tuesday, Clinton renewed her attack on Sanders’s proposal for a single-payer “Medicare for All” healthcare system. “The numbers just don’t add up, from what Senator Sanders has been proposing,” said the former secretary of state. Sanders countered by arguing what Clinton claims is undoable has been done elsewhere—and can be done in America. That was how it went through the most combative Democratic debate yet in a campaign season that—because of the unexpected strength of an insurgent challenge to a front-runner whose candidacy was once considered “inevitable”—is now expected to see a lot more Democratic debates. At one point, Clinton said, “we have a vigorous disagreement here,” and she was right. But that disagreement was about more than specific issues and agendas; that difference was about the boldness of the visions advanced by two contenders and about what can practically and realistically be achieved. On Thursday night, the candidates drew clearer lines of distinction between themselves. Clinton presented herself as “a progressive who gets things done.” Sanders presented himself as a progressive who wants to get more done. Both Clinton and Sanders are successful political leaders. Both have been elected twice to the Senate. Both have compromised when necessary. Both have made mistakes. Both in the course of their long careers have inspired Americans to imagine a better politics and better governance. But Clinton argued that they are limits on what can be achieved. The former secretary of state, who is trailing Sanders in New Hampshire polls, asserted that “Senator Sanders and I share some very big progressive goals.” She presented herself as “a fighter.” Yet she seemed to suggest that some of the fights that grassroots Democrats want to wage are unwinnable. “No, not at all,” responded Sanders, who argued that there is nothing radical about guaranteeing healthcare for all, about making public colleges and universities tuition-free, about making massive investments in infrastructure improvement and about taxing corporations and eliminating tax havens. The primary barriers to necessary change, he explained, are political. Sanders accepted the invitation, delivering the most powerful statement of the night—and one of the most powerful statements of the campaign. “Let’s talk—let’s talk about issues, all right?” he began. “Let’s talk about why, in the 1990s, Wall Street got deregulated. Did it have anything to do with the fact that Wall Street provided—spent billions of dollars on lobbying and campaign contributions? Well, some people might think, yeah, that had some influence.